"Next Day" Delivery on this item takes 2-3 working days. Need Faster Delivery? Express Next Working Day delivery is available on request at an additional charge IF ORDERED BY 1pm. To place an Express order select SAT delivery at the checkout. If chosing this option you must call 01924 589589 to notify us whether you wish to recieve on Next Day or Sat. Experience great outdoor cinema at an unbeatable low price with the inflatable 120" outdoor projection screen. Whether you are looking for a screen in a beer garden, at home in the garden, or an event; this canvas presents your pictures with an impressive picture diagonal of over 350cm. 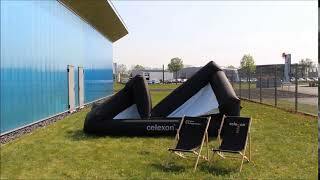 Experience great outdoor cinema at an affordable price with the inflatable outdoor screen. Whether you are looking for a screen in a beer garden, at home in the garden, or an event; this canvas presents your pictures with an impressive picture diagonal of over 350cm. The special PVC projection cloth has a black back that block out light, meaning that light sources behind the screen have almost no disturbing influence on the projection. The finely textured surface can handle 4K UHD content without loss of quality.Thanks to the velcro strips, the attachment of the projection cloth is possible on your own, allowing for optimal fabric tension. Compared to classic folding frame screens, the outdoor screen has a low weight and a small pack size and is therefore ideally suited for mobile use. The sturdy and durable nylon material is anchored by guy ropes and metal pegs in the ground.